After I published the Media Industry Social Leaderboard numbers for January, I realized that I haven’t spent much time talking about the other social operating systems. While Facebook is the clear #1 traffic distributor, there is a race on for second-in-command. Twitter holds its solid lead (with 61% of the non-Facebook social referrals); however, Pinterest has shockingly pinned the #2 spot, beating out Tumblr. The odds may not look incredibly promising now, but Pinterest is undeniably gaining clout in certain niches – they became the top social referrer to marthastewart.com this past summer. 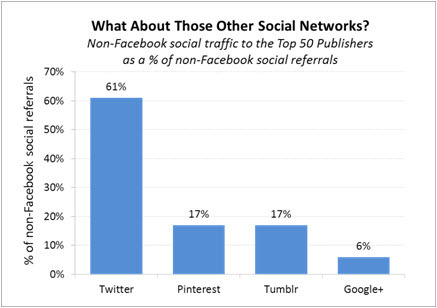 Tumblr, neck and neck with Pinterest at 17%, is another underdog with potential. While these are certainly horses to keep an eye on, your bookie should remind you that Twitter, Pinterest, Tumblr and Google+ combined account for only 0.2% of total traffic to the Top 50, which is well below Facebook’s 6.7%.